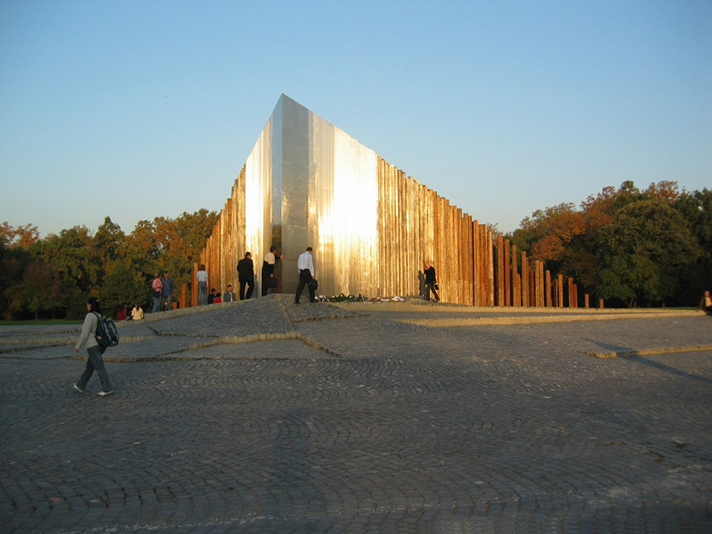 The plans of the Monument were selected in an international open competition in 2005. The jury (Dr. Hans Belting, Internationales Forschungszentrum Kulturwissenschaften, Géza Boros art historian, Péter Csíkvári sculptor, Dr. Júlia Fabényi art historian, István Ferencz DLA architect, Tamás Körösényi DLA sculptor, Dr. Antal Lázár DLA, architect, Attila Zsigmond Budapest Gallery) decided to reward seven plans from 79 submitted plans. Kata György and Csaba Horváth - artists, Tamás Emődi-Kiss and Tamás Papp - arcitects. Az 1956-os forradalom ötvenedik évfordulójára állítandó emlékmű terveit nyílt, nemzetközi tervpályázat alapján választotta ki a zsűri 2005-ben. A tervpályázat győztese az i-ypszilon alkotócsoport - György Kata, Horváth Csaba - képzőművészek, Emődi-Kiss Tamás, Papp Tamás - építészek. Az emlékművet 2006 október 23-án adták át. meghirdetett pályázaton a szakmai zsűri által 20 legjobbnak ítélt mű kategóriájába került. 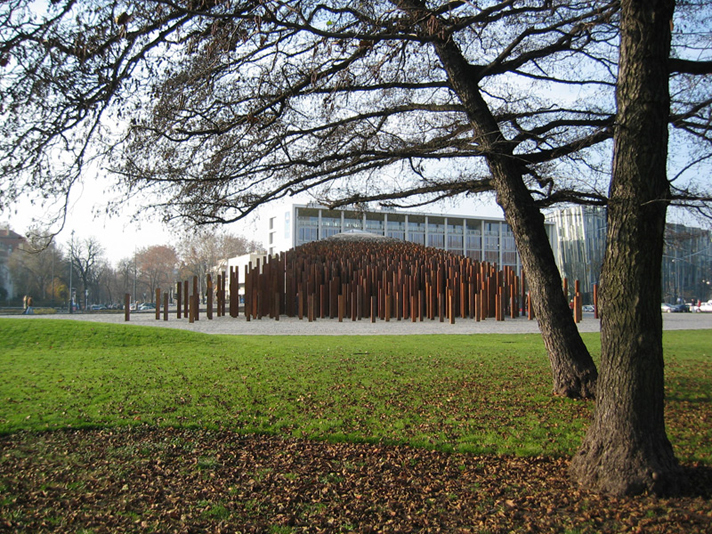 The starting points of the design of the memorial were those well-known photos, which depict the undergraduates marching to the sculpture of Jozef Bem from the Polytechnic University, on October 23 1956. The wedge-like shape symbolizes the people going arm in arm, trusting each other, and the power of community. The memorial stands at the border of the City Park. The base of it is a square, that evocates the contemporary streets, the square of silence, that gives an opportunity to personal, engrossed remembrance. The rustically corroded, man-sized, iron columns emerge from here, and it is possible to walk among them until the tierce of the work. The spectator can become a segment of the community, marked by the columns; can seek for the opportunity in himself, that led common men to heroism in 1956, and that is still a part of our humanness nowadays. Moving forward along the axle of the work, the columns are located increasingly tighter, their material gradually brightens, they become higher and higher, when finally they unite by formulating a perfectly consistent, eight-meter tall, stainless high-allowy steel block. This wedge refracts the overlay of the Felvonulási street, referring to the force of the revolution, what appeared at this location also. 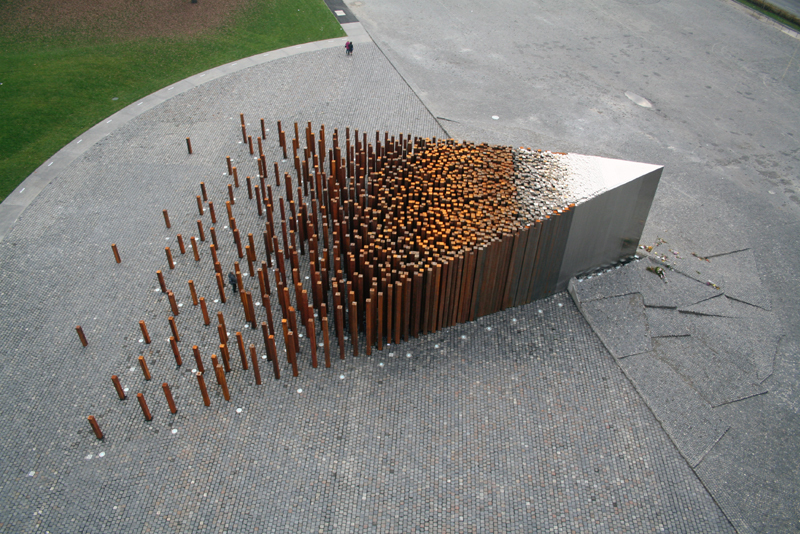 The monument commemorates to that unique moment, when the citizens of Hungary overcame their own individualities, in order to stand up as members of the united community, for the idea of freedom and independence. The monument does not wish to illustrate, but intends to make it possible for the spectators to imagine themselves living through those events of history, thus the remembrance should have an effect on the present days.